Find the latest news posted by ASAPA. SUBSCRIBE TO BE NOTIFIED OF POSTINGS: If you are logged in just click on the Subscribe link at the top of this page. If you are not logged in, you will need to log in and then navigate back to the blog and then click on the Subscribe link at the top of the page. COMMENT ON A POST You must be logged in to post comments. The comments box is located at the bottom of the post but can only be seen if you are logged in. In the last week we have been notified by several PAs in Arizona about a negative radio ad playing on several different stations in the Phoenix market regarding the care provided by PAs and NPs. Thank you for reaching out regarding your concerns. We wanted to provide some historical information. These ads are being run by an organization called the Hospitalist’s Union. Last summer, similar advertisements played on the radio; these ads were targeting physicians and inviting them to attend a meeting for the Hospitalist’s Union. An ASAPA representative went to the location of the meeting, and observed that there were about five people that showed up despite the heavy advertising that had occurred. Based on the lack of following the physician running this organization seems to be generating, and after consulting with the AAPA, ASAPA opted not to make any formal response to the ads at that time. We felt that by officially responding we may actually give him more of an audience than he would ever get on his own. The ads that have resurfaced in the past week have an intended audience of patients rather than physicians, and have a more specific message of disparaging the care provided by PAs and NPs. For this reason, we once again sought advice from the AAPA regarding our approach. They have further researched the organization and have determined that the organization was started in early 2016, and despite the ads that have been run and the local meeting that was coordinated, the organization has not been able to gain much of a following despite three years of sporadic advertising. The AAPA’s Communications and Marketing team is continuing to monitor the situation to determine if a response is needed, but have not recommended an official response at this time. In our communication with the AAPA team, we were reminded of the national ad campaign they have been working on this year in partnership with the NCCPA. The ad campaign is focused on promoting the value that PAs bring to healthcare, and as you may have already seen, the ad was carried in the Arizona Republic last fall. Another USA Today ad is supposed to run next Friday, February 8. Additionally, we’ve been advised to stay tuned for more ads to come in NPR and AARP. Many of you likely already saw the announcement sent out yesterday from the Arizona Regulatory Board of PAs (ARBOPA); however, ASAPA also wanted to send official notice to our members that Governor Ducey has signed HB2075 (SB1108). The bill had an emergency clause so it is immediately effective. Any disruptions or barriers to the appropriate prescribing of schedule II and III controlled substances by PAs should now be resolved. If you encounter any difficulty with prescribing these substances, please refer the pharmacy/pharmacist to the final bill signed into law on February 14, 2019. If you still encounter barriers after referencing HB2075, please reach out to ASAPA so we can communicate with ARBOPA and the Pharmacy Board. We are proud of the work that went into resolving this issue, and are thankful to our membership for supporting the organization. Your membership allows for support of our Association lobbyist, an invaluable partner when working on such serious matters affecting PA practice in Arizona. We urge you to tell your PA colleagues about this situation, and invite them to help make the Association even stronger by becoming members themselves. Membership applications can be found on the website. This is an update to prior memos regarding the disruption to schedule II and III controlled substance prescribing. We are pleased to report that as of February 11, 2019, HB2075 (SB1108) has been passed by both chambers of the Arizona legislature. The final bill is now ready for review and signature by Governor Ducey, at which time it will be immediately effective. The Governor has five days to complete this action. We would like to thank the PAs of Arizona for your patience as ASAPA worked with our Association lobbyist and ARBOPA to correct this legislative misinterpretation as expeditiously as possible. This situation presented a significant barrier to PA practice causing patients to experience unnecessary interruptions in accessing needed medical care. However, we do feel the resultant legislation is even stronger in identifying and clarifying PA prescriptive authority. The amendment to SB1108 (corresponding HB2075) was adopted in the Senate Health and Human Services (HHS) committee on January 30th without any discussion or opposition. The bills are now ready to be voted on by their respective chambers, and if approved, the last step in this process will be Governor Ducey’s signature. We will continue to provide the membership with updates as they are received. Please feel free to reach out with any questions. This is an update to the prior memos of 1/21/19 and 1/23/19 regarding the disruption to schedule II and III controlled substance prescribing. The amendment to HB2075 was adopted in the House Health and Human Services (HHS) committee on January 24th without any discussion or opposition. The same amendment will now be introduced to SB1108 at the Senate HHS committee on Wednesday, January 30th. We continue to have consensus around this issue, and are optimistic that the Senate amendment will be adopted as seamlessly as the House amendment. The next step would be for both bills to go to their respective chambers for a vote, and then the bill would be ready for signature by the Governor. As mentioned previously, ASAPA is working closely with our Association lobbyist, who has assured us this is the fastest possible process for getting this situation resolved. We will continue to provide the membership with updates as they are received. Please feel free to reach out with any questions. This is an update to the prior memo sent on January 21st. ASAPA is continuing to work very closely with our Association lobbyist and the Arizona Regulatory Board of Physician Assistants on the controlled substance prescribing issue that is limiting PAs to prescribing a 72-hour supply of schedule II and III controlled substances. As of this morning, an amendment to HB 2075 has been introduced by Senator Nancy Barto. HB 2075 is a fast-track bill moving through the Legislature to address e-prescribing issues associated with the enactment of the Opioid Act during the 2018 legislative session. The proposed amendment is attached and addresses the practice barriers PAs have been experiencing in the past week. Since this is a fast-track bill it would take effect upon signature by Governor Ducey. There continues to be consensus among physicians and hospitals over the need to correct the interpretation that has created this prescribing limitation so ASAPA continues to be optimistic that this situation will be resolved quickly. ASAPA will continue to communicate updates with you as they are received. Thank you for your membership in ASAPA; members are vital for supporting advocacy and legislative efforts. If you have colleagues that would like to further support the organization by becoming a member, please direct them to our membership page. On January 17, 2019, ASAPA was made aware of many practicing PAs in Arizona being told by pharmacies that PAs can only prescribe a 72-hour supply of schedule II and III controlled substances. The Association has been actively pursuing additional information and working to resolve the problem. During the 2018 legislative session, HB 2250 passed, which was intended to certify PAs for 90-day prescription privileges for non-opioid schedule II and III controlled substances. Unfortunately, the final language that was passed in HB 2250 (attached) is being interpreted to restrict the prescribing of schedule II and III controlled substances to 72-hours. HB 2250 was intended ONLY to increase the prescribing limits of non-opioid schedule II and III controlled substances to 90 days, and to otherwise leave prescribing privileges unchanged. Unfortunately, explicit language was not included that indicated the ability to prescribe for up to 30 days was remaining unchanged. 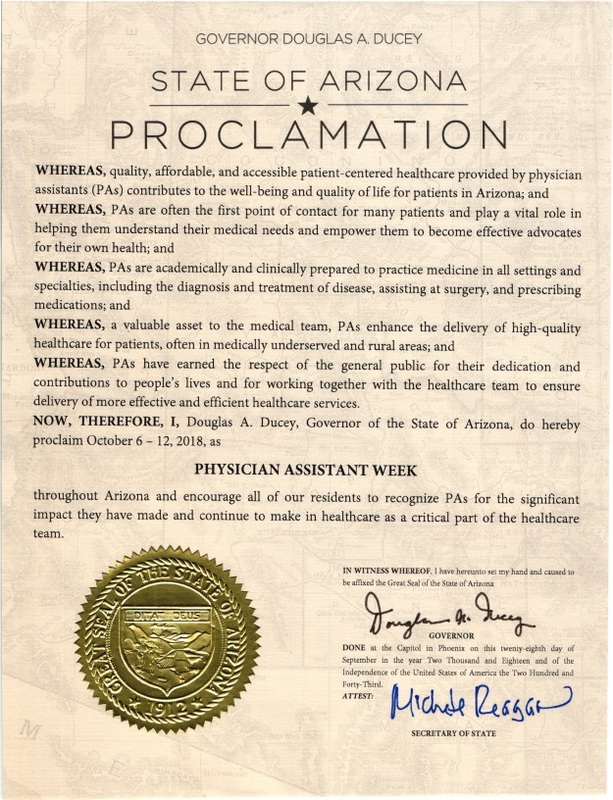 After HB 2250 passed, ASAPA testified at both the rule-making hearing and at the Arizona Regulatory Board of Physician Assistants (ARBOPA) board meeting expressing concerns about possible misinterpretation. ARBOPA now understands our concerns and we are working very closely with ARBOPA and our association lobbyist to identify the most expeditious solution to this problem. Currently, it appears this will likely occur in the form of amending a fast-track bill moving through the Legislature to address e-prescribing issues associated with the enactment of the Opioid Act during the 2018 legislative session. There is consensus among physicians and hospitals over the need to correct the interpretation that has created the prescribing limitation. ASAPA will communicate updates with you as they are received. Please be ready to reach out to your legislators, if needed. We are aware of the significant burden this is placing on PAs, especially PAs practicing in pain management and other disciplines that regularly prescribe these medications. Please know that we are doing everything in our power to resolve this barrier to PA practice and to the health care needs of our patients. Happy PA Week to you! Thank you for all you do for the profession and your patients! Preparing for elections in November? A Voting Guide to the Arizona Ballot Propositions has been prepared by the ASAPA lobbyist team at Goodman Schwartz Public Affairs. ASAPA members can access this guide under the Members Only tab. You must be logged in. One of the most significant provisions of the Arizona Opioid Epidemic Act, SB 1001, is the prescriber electronic transmission requirements for prescribing opioids. Electronic prescribing of controlled substances (EPCS) mitigates prescription fraud to prevent the occurrence of fake prescriptions, as well as reduces prescribing errors and improves the accuracy of medication dispensing. These new requirements go into effect in 2019. Beginning January 1, 2019, each prescription order for a Schedule II opioid in Maricopa, Mohave, Pima, Pinal, Yavapai, and Yuma counties must be transmitted electronically to the dispensing pharmacy. The only exception is for Medication Assisted Treatment (MAT) for substance use disorder, or if a waiver is granted to a prescriber (see below). Beginning July 1, 2019, these same requirements go into effect in Greenlee, La Paz, Graham, Santa Cruz, Gila, Apache, Navajo, Cochise and Coconino counties. We urge you to assess your clinical practice capacities and determine if you are compliant with these impending opioid e-prescribing requirements to avoid and/or minimize any disruption to your practice and patients. It is important to note that e-prescribing controlled substances must satisfy the Drug Enforcement Administration’s Electronic Prescriptions for Controlled Substances (EPCS) system requirements and may cost more than basic e-prescribing. Many of the most common electronic health record vendors have both e-prescribing and EPCS capabilities so contact them for more information. To find out if your EHR vendor is EPCS-certified, you can also check the Surescripts website. Pursuant to Arizona Revised Statutes 36-2525 Q., the Arizona State Board of Pharmacy is required to grant waivers to medical practitioners who lack adequate access to broadband or face other hardships that prevent implementation of EPCS. The maximum duration for a waiver is up to one year. DO NOT DELAY! The deadline to get a waiver to the Arizona Board of Pharmacy for consideration before 2019 is November 15, 2018. Once the waiver form is completely filled out, email the form to pmp@azpharmacy.gov. If you have questions about EPCS, additional information is available on the Health Current website or you may contact them for phone-based support at 602-688-7200. With monsoon season, mosquito activity is increased in Arizona. The year’s first probable West Nile virus (WNV)/St. Louis encephalitis virus (SLE) case in Arizona is under investigation. Both of these flaviviruses are endemic in Arizona and have been detected in collected Culex mosquitos. WNV and SLE are most commonly spread to people by the bite of an infected mosquito. In 2017, Arizona had 110 reported cases and 8 fatalities of WNV and 6 cases of SLE. Nonspecific signs of fever, headache, myalgia, arthralgia, rash, and weakness. Meningitis, encephalitis, paralysis, or other acute signs of central or peripheral neurologic dysfunction. The majority of WNV and SLE infections are asymptomatic; however, infections in the elderly and among immunocompromised individuals can result in neuroinvasive diseases that can be fatal. Arizona clinicians should test serologically for both WNV and SLE if there is clinical suspicion for these mosquito-borne illnesses, with serum or cerebrospinal fluid collected after the first week from symptom onset. Providers should advise patients to prevent mosquito bites and they should contact local public health (https://www.azdhs.gov/preparedness/epidemiology-disease-control/index.php#resources-county ) regarding suspected WNV or SLE illnesses or questions on diagnostic testing. The ASAPA 2018 election results are in! A big thank you to the candidates for their time and commitment to serve in their new roles starting in July! The intent of “Arizona Vaccine News” is to summarize local, national, and international vaccine information that affects Arizona. With complementary and alternative medicine grabbing larger market share each year, physician assistants often increasingly find themselves learning more about herbal remedies from their patients before they hear about it in continuing-education courses. But if a clinic’s patient panel includes a large number of Hispanic and Latino populations, the list of supplements can be substantial thanks to the increasing popularity of neighborhood herbal shops called yerberías that cater to this clientele. Also known as botanicas, these retail stores sell herbs, creams, tinctures and teas. They may also carry talismans to ward off evil spirits and votive candles for events or ceremonies. Patients whose ancestral roots come from rural parts of Latin America may lean more heavily on the yerberías for help than the local pharmacy. Many of these substances pose little threat to the patient’s overall health. Manzanilla, for example, is the Spanish word for “chamomile” and is often formulated into a soothing tea for bedtime. Other substances often focus on treating the common cold or aching joints. They may include extracts from creosote, arnica, and chiles (think modern medicine’s capsaicin cream), and anti-inflammatory extracts like turmeric, ginger, black pepper and nettle leaves. However, products from yerberías lack FDA studies and approval. A 2013 study found that many of the substances patients receive from yerberías for the common cold may contain excessive amounts of lead, arsenic or mercury.